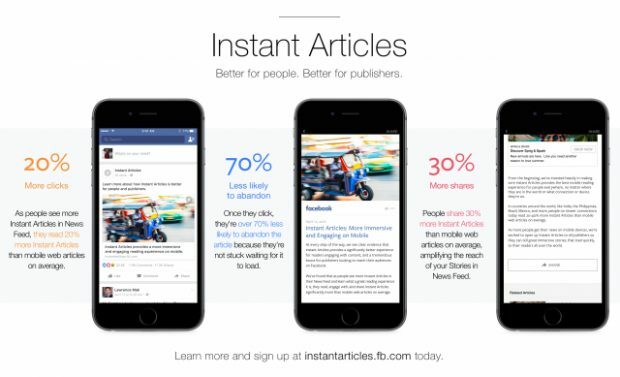 Even if you haven’t heard of Instant Articles yet, it’s likely you’ve seen them. Denoted by a lightning bolt icon on the image preview of articles on Facebook, Instant Articles are fast-loading versions of web stories that have been optimized for mobile. When users click on an Instant Article, they stay on Facebook to view the content, rather than following the link to another site. On April 12 Facebook rolled out the feature to all publishers. That same day, we wrote a blog post about why we decided to try Facebook Instant Articles. In it, we promised that once we’d been using Instant Articles for awhile, we’d write a second post to let our readers know how the experiment went. Some of you might be wondering what took so long. The explanation is simple: it took us longer than we thought to get up and running with Instant Articles. We finally published our first one on June 7. When we hit the “Publish” button and shared an Instant Article link in a Facebook post, we noticed a difference right away. Suffice to say, Instant Articles had our attention. Whatever it is, the noticeable increase of reach, shares, Likes, and link clicks for our first Instant Articles post suggests that this medium has the potential to be quite valuable to publishers. So, as promised, here’s what we learned through the process of setting up Instant Articles. While Instant Articles publishing isn’t overly complex, the setup requires a bit of technical know-how. We got our development team to handle setup. They installed the Instant Articles WordPress plugin in our blog content management system (CMS). Due to other items in their queue, the team wasn’t able to work on this task straight away, which slowed down the process somewhat. Getting our dev team involved in setup was critical for us as the process required access to the backend of the website and some coding expertise. For companies without dedicated developers to call on, we’d recommend contacting whoever built your website for help. Note that for publishers who don’t use WordPress, Facebook also offers an HTML5 RSS option for Instant Articles. When you add the meta tag to your site and “claim your URL” as part of the setup process it doesn’t jump start the publishing process. It simply tells Facebook where your Instant Articles are coming from. This is important because every Instant Article must have a corresponding web link. Instant Articles cannot host unique content, it is simply a faster, mobile-friendly version of your existing web content. Once you’ve claimed your URL, the RSS will populate the “Production Articles” tab with drafts which you can then tweak as needed before submitting for consideration from Facebook and, ultimately, publishing live. When we finally did gain access, we were unsure of what exactly to do next. While Facebook has provided plenty of materials to help users get started with Instant Articles, we found that the available resources were geared towards individuals with a deeper knowledge of technical requirements (and maybe a bit of dev experience as well). Reading through the materials with another person can be quite helpful in order to parse out the meaning. Trial and error is really the best way to get things done. Initially we were hesitant because we worried that we’d press a button and everything would suddenly publish. But we later discovered that when Instant Articles go live, they don’t post automatically to your Page’s Facebook wall. They’re simply available. That means that if someone happened to share a link to the corresponding article, and went to view it on Facebook mobile, it would appear as an Instant Article. But it doesn’t make it automatically appear anywhere. That realization took a bit of the pressure off. Originally Facebook required prospective Instant Articles publishers to submit 50 posts to the program for consideration. If approved, the publisher would be able to move ahead with posting their own Instant Articles. Not long ago, Facebook changed that requirement. They now require publishers to submit only 10 posts for consideration. This was fortuitous as even figuring out how to get 10 articles ready for submission was a feat! When you publish a new post in your site’s CMS, the RSS feed will also populate the “Production Articles” tab when you make updates to older posts. This was very helpful as we had some top-performing older content that we wanted to add to Instant Articles, so all we had to do was open and update the original post in order to send it to Facebook. Even if you delete an article from the “Production Articles” tab, the RSS feed will repopulate it. In order to get started, you need to set up a style template to apply to your content. The style template determines the font, font size, colors, etc. While Facebook offers the option to create your own style, we discovered that this option would also require us to add an additional line of code to every Instant Article we wanted to publish. For simplicity’s sake, we updated the “default” style template, as this required no additional steps to apply to our content. The style template options are somewhat limited, so it’s not possible to perfectly mimic the style of your actual site. We did, however, manage to choose elements that corresponded well to the overall look and feel of our site. We were able to match link colors precisely due to the ability to use hex color codes. We appreciated the ability to create a custom ID bar (effectively a header featuring our logo) as it helped our Instant Articles look more like our site. When it comes to Facebook Instant Articles, a little bit of coding knowledge goes a long way. Our team found that posts from our blog typically transferred into Instant Articles with a couple of code issues. These were usually due to the formatting of social embeds and other rich media elements. This meant we often had to massage the article a bit in the Instant Article publisher tool before we were able to go live with it. The Pages Manager app is invaluable, as it allows you to preview Instant Articles prior to publication. We found this particularly helpful for troubleshooting, as we were able to compare the original article on the web with the Instant Articles version to determine if there was anything missing or broken. Facebook will display helpful orange triangle warnings in the “Production Articles” tab next to articles that have an issue. Once you open an article with an issue, that issue is helpfully highlighted in orange and, if known, the specific issue is stated. This feature made it easier for us to troubleshoot and make our articles look good. Sometimes, however, Instant Articles may not be able to identify what’s wrong with a particular section of code. These instances required a bit of detective work, along with some trial and error, to fix. In cases where there was an error, we found it helpful to compare the code of the Instant Article with the code in our site CMS. We typically worked with both open (as well as the published piece and the Pages Manager app article preview). This was helpful particularly when figuring out which elements weren’t functioning properly. When working on issues, we found the Common Errors and Troubleshooting Tips section of the Facebook for Developers guide to Instant Articles helpful. Embeds from Twitter and Instagram must be in the blog post code as shortcodes, rather than full embed codes, in order to format correctly in Instant Articles. Images were a bit glitchy when we were working on articles to submit to Facebook. At certain points, images would disappear then later reappear. This has yet to be a problem with any of our drafts since we received Facebook’s stamp of approval to publish Instant Articles. We’re still testing Instant Articles and are eager to see what results they yield over the long term.